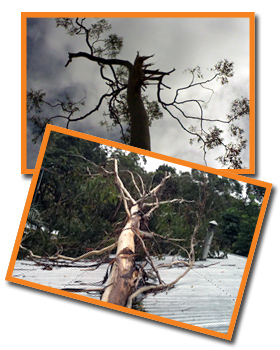 Need Emergency Tree Removal in Brisbane & SE QLD? We offer a 24-hour emergency tree removal response service and as we carry out work for many of the major insurance companies, we are familiar with their policies and procedures. In most instances, once a claim has been approved, we will carry out the approved work and bill the insurance companies directly and you will simply be responsible for payment of your excess, if you have one. A-Local Tree Service is accessible at all times and outside of normal business hours, the office telephone is diverted to a mobile phone that is in the possession of a staff member at all times. Prices upon request, our friendly staff look forward to assisting you with any questions you may have.